Tooth stains or discolorations are some of the most common conditions treated by a cosmetic dentist. Mild cases can often be resolved by simply following a few basic self-care tips. If the problem persists, then you should seek professional dental help. Treatment options include in-office whitening, veneers, and crowns. Extrinsic discoloration. This is caused by products like coffee, tea, colas, or cigarettes staining tooth enamel. Intrinsic discoloration. This occurs when the inner layer of the teeth, known as the dentin, darkens or develops a yellowish tint. Common causes of this problem include excessive fluoride in drinking water and use of tetracycline antibiotics. Age-related discoloration. This type of discoloration is caused by a variety of factors, including dietary choices, thinning enamel, and damage to teeth such as chipping. Using a toothpaste with teeth whitening additives. Limiting consumption of strongly colored beverages such as tea, coffee, and red wine. Avoiding tobacco products. Cigarettes, chewing tobacco, etc. will not only discolor your teeth, they pose serious risks to your overall health. This is an important supplemental step to brushing, one which many people overlook. Using a dental rinse or mouthwash. Look for a brand with teeth whitening benefits. Professional whitening treatments. Please don’t confuse these with over-the-counter whitening kits you’ll find online or at your local retailer. These products are only available through prescription. They use medical-grade formulas to achieve superior results. 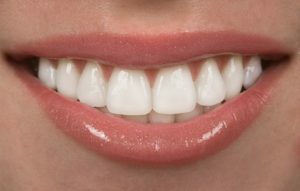 Dental veneers. These are like a makeover for your mouth. Usually made from porcelain, they bond directly to the exterior of your teeth to create a beautiful whitening effect. Veneers can last for many years with only basic care. Dental crowns. A crown is a restoration that sits atop the base of a damaged or discolored tooth and is held in place by a special medical-grade adhesive. Crowns are used to arrest tooth decay and provide smile-enhancing results. Dental bridges. As their name implies, dental bridges span the gap between missing teeth. Primarily used to restore the missing tooth’s functionality, they also offer aesthetic benefits. Composite bonding. This technique uses a special dental resin that’s color-matched to your natural teeth and applied over stains and discolorations. Dental implants. An implant is an artificial tooth supported by a titanium screw located underneath the gum line. Sometimes the best way to deal with advanced cases of discolored, damaged or missing teeth is with a full or partial denture. Most of us will deal with tooth staining or discoloration during our lifetimes. Try the self-care tips outlined in this post or make an appointment with a cosmetic dentist for a professional consultation. You’ll soon find yourself smiling at the results. Dr. Dennis Stansbury earned his DDS degree from Baylor College of Dentistry in Dallas. He has more than 40 years of experience treating all types of dental conditions, including cosmetic and restorative problems. You can reach his office online or by calling (903) 561-1122.